So I’d discussed the weakness of the F55 in the comparison review with the D50 dSLR. The F55 is arguably the cheapest Nikon film bodies you can buy but does spending a bit more snag you a better camera in the guise of the F75. The reality is it a bit more nuanced. In the end it depends on what lenses you have and what your expectations are. The F75 was launched in 2003 , two years after the F55. It technically replaced the F65 but weirdly overlapped that model. It sat between the F55 and the higher end consumer models like the F80 & F100. Like the F55, it was made in Thailand and would cease production 2006. It commanded around a $40USD price hike over the F55 when sold with the same 28-80mm G kit lens in Abe’s of Maine Advert in September 2005 Popular Photography ($189.99 v $229.99). Worth noting that Abe sold the lens for $89.99. 13 years later and without a lens the F75 body only on eBay L5S price is £22.58 inc P&P. Worth noting this featured a bargain it was working when I last used it £2.05 + Postage and a whooping £42.99 + postage outlier. The F55 LS5* inc P&P is £8.53 for comparison and from the looks of things I’m not the only one who paid around a quid for one. If you’ve no lens its worth trying to get both of these with a lens as you’ll pick up either with a stock 28-80mm or 28-100mm G class for often only £10-20 more (if you hate the lens you’ll likely sell it for more). So Does 15 quid get you a better camera ? The short and technical answer is yes but I’ll challenge you to think about if actually you would use the pluses or could you get by with the F55 with a lens for example for the same price as a F75 body only ? 25 Segment 3D Matrix Meter V 5 segment 3D Matrix Meter. That said it does allow you switch to spot meter or centre-weight anytime and there’s the lens support issues (it is much faster to lock with AF-S lenses). The DoF preview is genuinely useful although you’ll use it less than you think. External flash TTL support is also a boon. The F75 kinda wipes the floor with the F55 here. Both are fine with AF-D lenses offering full features support. Both cameras can mount and use Manual focus AI, AI-S lenses including the E series. However neither camera will meter with these meaning you’ll need to shoot in manual mode. Both offer rangefinder assist with some lenses which is just as well as focusing on their viewing screens manually is less than ideal. You’d need to look at the F100 to get metering support. It’s with the newer AF-S class lenses that the F75 leaps ahead. AF-D lenses were dependant on a motor in the body to focus. AF-S & AF-I lenses have a built in motor and launched in ’92. at the time of these cameras launch the AF-D lenses made tended to be cheaper and aimed at the consumer whilst most AF-S were high end. It becomes more of an issue as time goes on as AF-S lenses have largely taken over especially in the digital age. 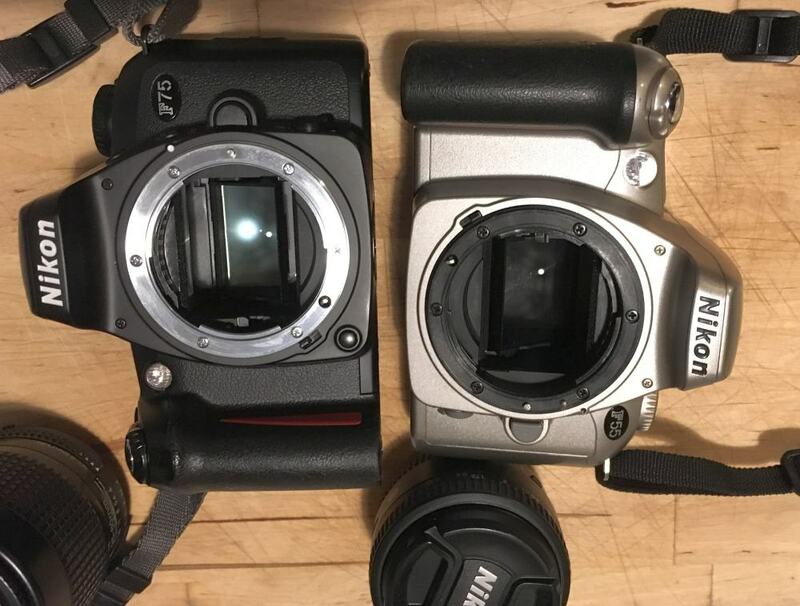 Many consumer Nikon dSLR don’t support AF with AF-D. The D50 was the last entry level model to support fully support AF-D.
Nikon muddy the water further with G class lenses. 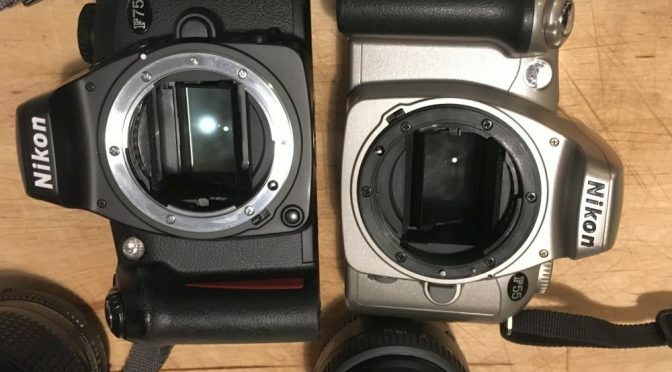 These are lenses that lack the aperture ring. Now this is a moot point for later film cameras and dSLR as you’ll usually lock this in non G class lenses. G class lenses at the time these cameras were launched were pretty much only AF-D lenses but within a few years AF-S G class lenses appeared and it’s not always easy from lens designation to tell the difference. 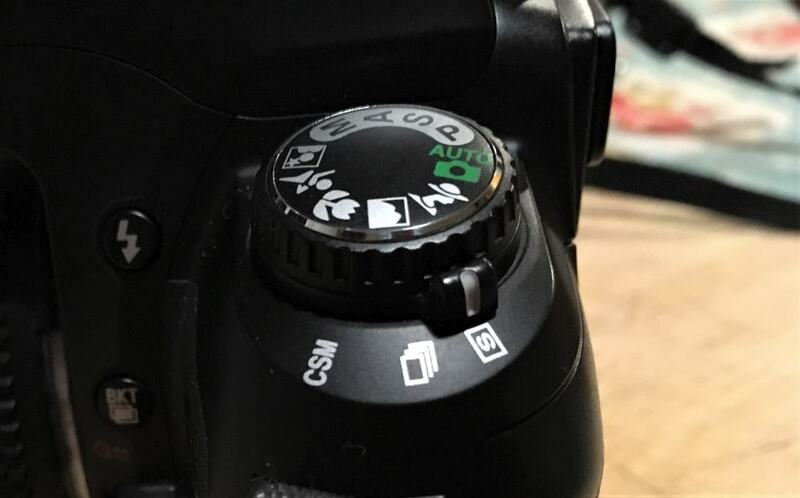 The clue is on the lens mount AF-D lenses have 5 contact pins and a coupling slot for the lens motor. AF-S have 7-10 pins and no coupling slot. The F75 is the better body by some margin and is easily worth the extra pounds. Neither is that expensive but if you have a a shed load of AF-D or MF lenses (AI or better) you’ll not likely find a massive difference unless you have certain requirements like needing to use external flash. In fact you can easily pick up F55 with a kit G class lens for about the same price as a F75. However if you’re stepping back from a dSLR you’ll find the AF-S support makes the F75 a much better buy. It also has a proper metal mount and comes in black !! Curiously this isn’t the first musing on these 2. In 2004 there was a discussion thread at ephotozine. Over at photo.net there’s a 2003 discussion of the F55 v F65. * L5S = Last 5 Sold (eBay.co.uk) average price (inc P&P) at time of writing. 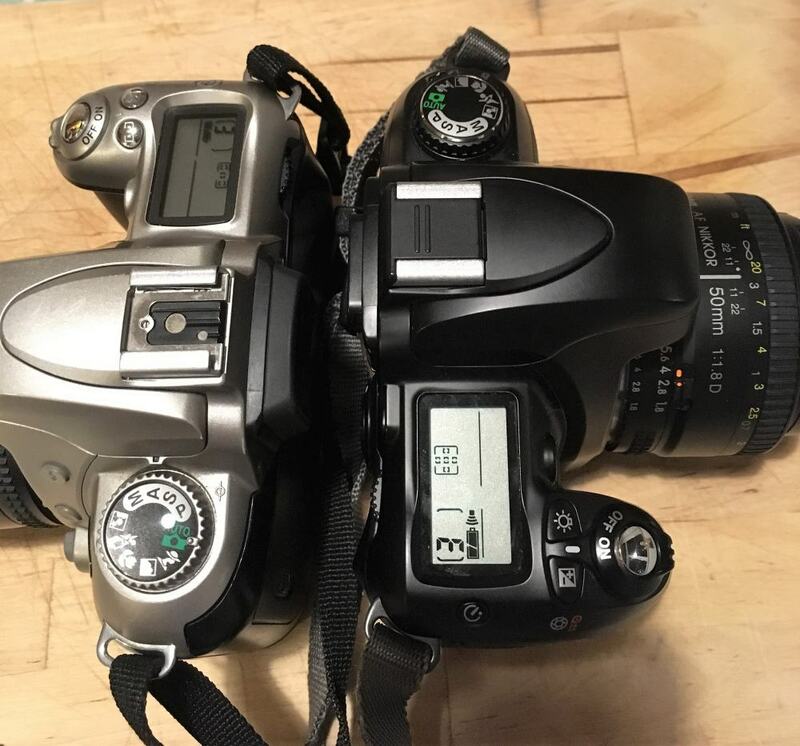 In this case only camera bodies that were sold are listed as used but working are included. I exclude cameras with ridiculous postage or overseas shipping. Cameras with lenses are also excluded even if cheap. Alan, a nice comparison. My feeling is that given that these cameras are cheap anyway, there’s little point in getting the F55 over F75 because, overall, your pros and cons lists say it all. Why compromise for the sake of a few (very few) £’s in their respective prices? Absolutely agree, Alan. The higher up a range we go we do get extras and better build quality, leading to more durability. But if the cameras all use the same lens I’d wager no one would be able to tell which camera had been used. For me, it’s always more a question of the lens rather than the body.